Marizaan van Beek a CZT from South Africa is hosting The Diva's challenge this week. What a challenge it is! Marizaan challenged us to use paradox in a spiral. Every time I see a triangle, I am prepared to fill the space with Paradox but to put Paradox in a spiral? Hum, that was a mind bender. However, I decided to jump right in and see what happens. I have learned that sometimes tangles look very different when used in a new way. What can it hurt? I drew a spiral on the tile and got started. It wasn't so hard really. I don't make Paradox as lovely as Marizaan does, but I don't think I do so bad. (You should click the link above and seemarizaan's tile.) 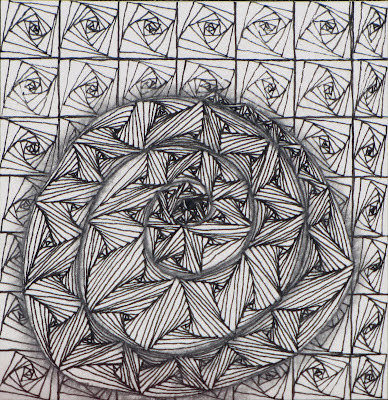 There were times though that I was afraid that the spiral would get lost in the drawing. 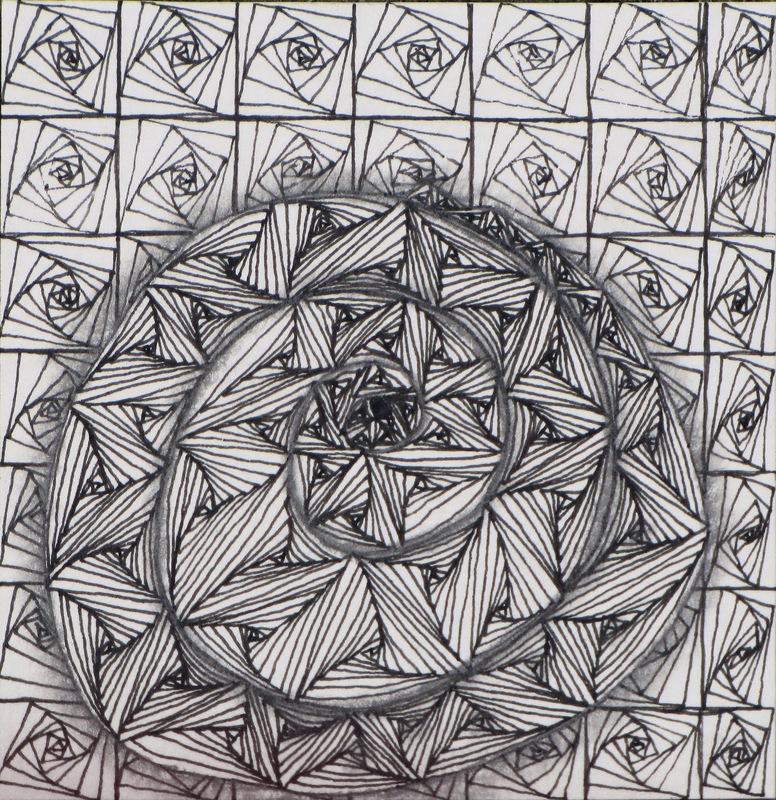 I decided to go in with a 05 micron and draw the spiral with a heavier line. I also made a small black oval at the center to make a definite end to the spiral. After I got the spiral done, I decided to keep it simple and use Paradox in a square for the background. As for shading, I kept it SUPER simple and just shaded the spiral line and around the outside of the spiral itself. This was a great challenge Marizaan thank you so much for it. Spirals are usually something that I don't use very much but I have to say, after this challenge, I am certainly going to explore more. Your tile is beautiful. What a beautiful spiraled paradox! Very pretty "braid" of paradox sitting on the background. Very nice. I love the way you did the background. Nice idea and a great 3D effect. Great idea to combine a curvy Paradox with the straight grid version. Nice tile! I like the use of it in the background - great idea! Excellent shading and contrast with the background. Gives it an almost 3d feel.